Within the past two months, the Lighthouse team has grown by nearly a dozen people and now includes an addictions counselor, nurse practitioner, special care aid, and paramedics. The Lighthouse is a community-based organization that provides emergency shelter, supported living and affordable housing to those in need. Staff were hired as part of a six-month pilot, resulting from the Region’s 14 Day Challenge, to expand services. The goal of the pilot is to reduce the number of monthly admissions to hospital from this location. McKnight, a health region employee, started working part-time at the Lighthouse a year and a half ago. 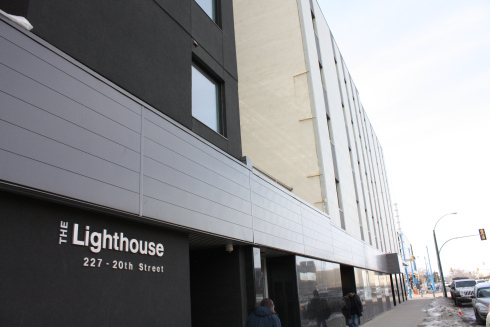 The Lighthouse is one of Saskatoon Health Region’s many partners. Fortunately, one of McKnight’s current diabetic clients, who does not have a home and is living temporarily in the shelter, is having a much different experience. As a result of the pilot, the client now has access to a new team of care providers as well as access to expanded hours in the stabilization unit, which provides emergency shelter to clients under the influence of drugs and alcohol. “This person was sick the other day, and because the stabilization unit is now open 24 hours a day seven days a week, we sent this client over there to rest and be monitored,” says McKnight, who is seeing how the pilot is making a difference in the health of Lighthouse clients. Another service that has been expanded is the Mobile Outreach van, which allows a team of two to provide transportation to homeless or struggling individuals to the Lighthouse and other support services. The van’s daily hours have been expanded from six to sixteen, and it now runs from 8 am to midnight.